I just want peoples views on the Duke 390, I miss a bike that I can thrash and not worry about losing my license, I always remember riding my 2 stroke Aprilal RS 125 and loved how much I could ride fast without worrying about easily getting to triple figures. Have a look at the Performance Bikes Magazine forum, there's a huge thread on there about them. My biggest fear is I will get bored of the power (or lack of. Will be good to hear some feedback. 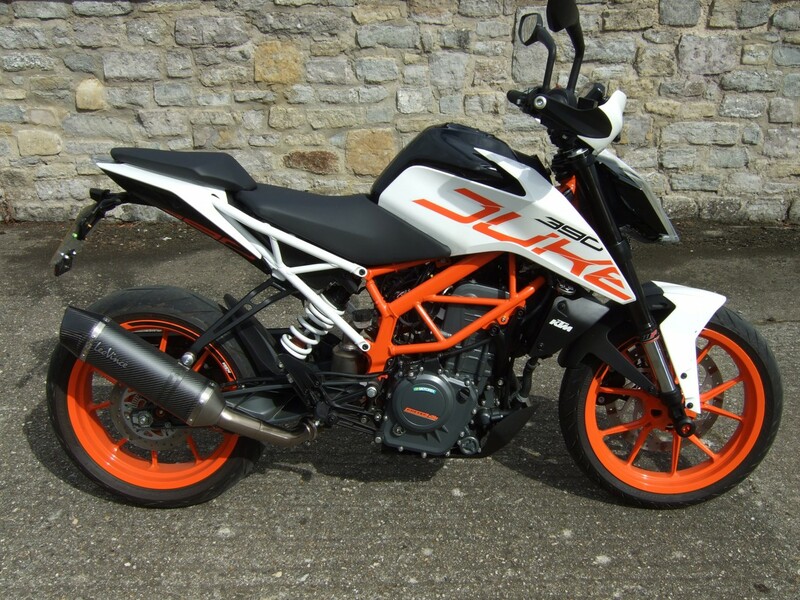 I bought one last December as ktm were doing a deal on pre reg ones. It's a riot. Enough power to overtake in most situations, weighs nothing and handles great. It's a bit vibey but that doesn't bother me too much and keep a decent coating of acf50 or likewise on it as even though mine's not an everyday bike there are bits that corrode quickly. Great fun though either on B roads or traffic. Thanks for the update, i am going to see if I can test ride one at the weekend to see what the power is like as it want it to be able to sit at 75mph on the motorway but also have enough torque for fun at the weekend. As along as it can put a smile on my face I I won’t get bored with it I will get one. Good to hear some good feedback. I do, Adie, and you're quite right - I love it. It works for me, as I live in the sticks where it excels. It's great for blasting around the country lanes, and it has a fair turn of speed - it'll do 70 mph easily. I had a mate come round on his BMW R1200 GS, and I left him for dead. It's so light at 150 kg (330 lbs in old money) dry, and so flickable - it's like riding a house fly. The suspension is basic and non-adjustable, but that's OK if you're of average height and weight. Any problems? Yes, the engine surges at low revs, due to lean running for emissions. It's a pain until cured with a piggy-back ECU - I have the Coober. Oh, and you have to get an after-market exhaust and a tail tidy (Evotech is the best). There ya go 2012StreetT! Always comes up with the quality goods does Bicksfizz. End user experience; impartial; informative; helpful and honest - doesn't get better than that! Thank you for your review, good to hear some unbiased feedback. Very nice looking bike too. Due to only covering 700miles last year I think I may sell my Triple and just have a 390, struggle to justify having both. My worry is that I will get bored with a 390 from having a 675. I live in Kent so mostly back roads and county roads on a Sunday morning. Occasionally I will be on the motorway too, good to hear it will get to 70 without any issues. Planning to buy brand new if I was to buy one. Expensive for piggy back ECU and set up for the 390? Really want the akrapovic exhaust. My worry is that I will get bored with a 390 from having a 675. I live in Kent so mostly back roads and county roads on a Sunday morning. Occasionally I will be on the motorway too, good to hear it will get to 70 without any issues. Planning to buy brand new if I was to buy one.